In geographical terms, there is roughly a 5,700-mile distance between Lake Forest, Calif., and Lahti, Finland. In hockey terms, the gap is much closer than one might think. That's because a native Californian, Ryan Lasch, has become something of a hockey sensation in the small Finnish suburb located 60 miles northeast of Helsinki. Lasch, 25, has played a major role in helping Pelicans Lahti to within three victories of winning the championship in the SM-liiga. On the heels of winning the regular season scoring championship with 62 points (24 goals, 38 assists), the speedy right wing leads all players in the Finnish playoffs with 15 points (5 goals, 10 assists) through his first 14 playoff games. The import player's stellar performance puts him in some fine historical company. Over the years, the SM-liiga has been something of a haven for undrafted North American collegiate players -- especially undersized ones like the 5-foot-9 Lasch -- to show they can play the game successfully at the professional level. In the past, undrafted American players such as Tim Thomas and Brian Rafalski and Canadian players like Cory Murphy went to play in Finland after their U.S. collegiate careers. The caliber of play within the Finnish league has dropped a notch in recent years. For financial reasons, the league attracts fewer big-ticket returning native-born former NHLers and notable veteran imports than it did in the late 1990s and early 2000s. Nevertheless, Lasch's performance throughout this season has been quite impressive. It is Lasch's first year in the SM-liiga and just his second season as a pro in Europe. In February, the Pelicans rewarded Lasch with a contract extension, pre-empting a bidding war with other European teams for his services next season. At the collegiate level, Lasch was an outstanding player in the WCHA for the St. Cloud State Huskies. He averaged better than a point-per-game for his collegiate career, and was an offensive impact player for his team even in his freshman season. A Hobey Baker Award finalist in 2007-08, Lasch was also honored as part of the NCAA's All-Academic team as a senior in 2009-10. In his last college season Lasch recorded his second 20-goal season and finished with 49 points in 43 games. He played on a line with current Philadelphia Flyers prospect Garrett Roe (originally drafted but unsigned by the Los Angeles Kings). 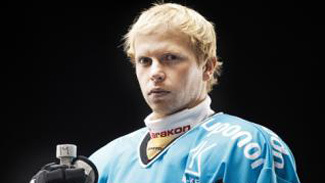 Undrafted by an NHL club, Lasch signed as a free agent with a Swedish team, Södertälje SK, for the 2010-11 campaign. SSK was a weak team that ultimately got relegated from the top league at the end of the postseason. Nevertheless, Lasch gave a solid accounting for himself, finishing second on the squad in scoring (30 points in 55 games). After the season, he was recruited to Lahti. Lahti finished in second place during the regular season. The team dealt with severe adversity in the quarterfinals, losing star goaltender Niko Hovinen for two games when he sustained a lower-body injury in the process of recording a shutout in an opening game 5-0 home victory over Kärpät Oulu. The Pelicans then lost three straight games. The Pelicans battled back to capture the next three games in succession, including a 4-3 overtime victory in Game 6 to force a seventh game. In the clincher, Lasch was held off the score sheet but his teammates built up a 3-0 lead before a late Kärpät rally in the final nine minutes of regulation produced two goals. Hovinen (24 saves) and the Pelicans' defense prevented a tying goal, however. The semifinal round against the Espoo Blues went only a little bit easier for the Pelicans. Hovinen got reinjured in the first period of Game 1, and was lost for the remainder of the series. Backup goaltender Joonas Kuusela filled in capably, however, and the Lasch-led attack proved to be a little too much for the eighth-seeded Blues to handle. Lasch generated two goals and two assists in the Pelicans' 5-3 home win in the first game against the Blues. He assisted on the game-winner in the next match, a nifty setup of linemate Arttu Luttinen just 43 seconds into the second period. Lahti went on to win, 3-1. The Blues narrowed the gap in the series with a 2-1 road win in Game 3 (Lasch tallied the Pelicans' lone goal), but the Pelicans exploded for six goals in the next tilt to build a 3-1 series lead. In that game, Lasch provided a goal and a primary assist. The Pelicans made franchise history in Game 5, advancing to the finals for the first time since their founding in 1996. With the Pelicans leading the match 1-0 near the midway point of regulation, Lasch set up defenseman Joonas Jarvinen for his second goal of the game. The tally proved critical, as the Blues finally solved Kuusela later in the middle period but got no closer. Former champion JYP, which won the title in 2009 and finished in first place in three successive regular seasons from 2008-09 to 2010-11, entered this year's playoff as the fourth seed. The club steamrolled through the quarterfinals and semifinals, sweeping Ässät Pori in the first round and then taking out Jokerit Helsinki in five games. Hovinen, who remained questionable with his lower-body injury until the day of the first game of the finals, made his return to the lineup for Game 1 in Lahti. The 6-foot-7 goaltender turned back 37 shots by JYP to record the shutout. Lasch's line generated the first goal of the game, although the American did not draw a point on the play. Marko Poyhonen later added some insurance, and Hovinen made the 2-0 lead stand up the rest of the way. JYR rode a three-goal explosion in the second period of Game 2 en route to a 6-2 victory. Lasch did not record a point in the game. The series resumes in Lahti on Thursday. Game 4 will be in Jyväskylä on Saturday and Game 5 is in Lahti on April 23. If necessary, Game 6 will be played in Jyväskylä on April 25 and a seventh game would be in Lahti the following evening.